There’s something about January 1st that gives us a chance to take stock, to breathe and to know that the longest day is behind us as the promise of spring and brighter days awaits.In truth 365 days of possibility, opportunity and uncharted experiences lie ahead. Good, bad and of course at times more challenging than any of us would perhaps willingly choose. Today I opened up my email to receive the most wonderful message from someone I taught some time ago. It is always lovely to hear from previous clients etc but what made this message so special was the attached drawings she had previously done and decided to finally give me.. Suddenly I realized just what Pilates had meant to someone I was lucky enough to introduce Pilates too, truthfully I had no idea at the time just what an impact our wonderful Method was having but these pictures capture not only exactly what I love about Pilates but also what I try to bring to my classes and to the people participating. The Pilates body and mind to me is not only strong and flexible but resilient and able to embrace whatever comes along. The strength is found in not giving up but accepting that even the smallest efforts can result in great changes. That remaining flexible isn’t just about understanding the stretch reflex but also knowing that the mind and body are intrinsically linked to the spirit. The more generous we are with our knowledge and confident we are with sharing what we know as teachers and students the more we ourselves gain in our own practice and understanding of the Pilates Method. As I look forward to the year ahead, to teaching Pilates Retreats in Italy and Pilates breaks in Cyprus from May through October. To being part of the extraordinary event that will be the Inaugural Pilates conference on the Isle of Man in July.http://www.pilatesteacherassociation.org/ . To travelling back to New York and New Jersey in September to see both Pilates and non Pilates friends and where inspiration is found in a vision of scarlet and where relaxation is most definitely never in the same sentence as Pilates. But most importantly to exploring and challenging myself to face my fears, to take opportunities as they arise. My only resolution this year is to embrace more of everything and to consciously limit the impact of my own fears. I hope whatever you have or haven’t got planned for 2016 it brings you more than you can possibly imagine. 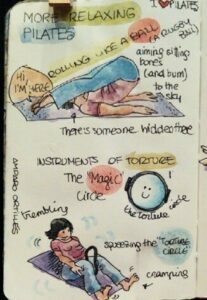 In the meantime I am just a happy Pilates teacher pleased to be drawn with color, humor and instruments of torture! Wishing you a wonderful 2016 All!